Also known as A Chair, A Fireplace, & A Tea Cozy. Or just Tea Cozy. Talking about books, TV shows, movies. 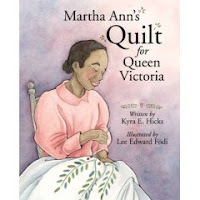 Martha Ann's Quilt For Queen Victoria by Kyra E. Hicks, illustrated by Lee Edward Fodi. Copy donated by author. The Plot: This is the true story of Martha Ann Erskine Ricks. She was born a slave in 1817; her father, George, was free and saved until he was able to buy his family's freedom in 1830 -- his wife, Grandma, Martha Ann, and Martha Ann's siblings, Jane, Mary, Wallace, Weir, Hopkins and Sarah. The family then moved to Liberia with the assistance of the American Colonization Society. Once there, Martha Ann is impressed by how the British Navy patrols the coast to stop slave traders from kidnapping people, and decides she wants to thank Queen Victoria in person. Martha Ann's life was not easy; once in Liberia, illness killed her entire family except for Martha Ann, Wallace, and Hopkins. Martha and her first husband survived attacks on the mission where they lived. But, Martha Ann had a dream: Meet the Queen. She also decided that she could not meet the Queen empty handed, so she designed and made a quilt for the Queen. Does Martha's dream come true? Of course. I liked the multiple layers in the book. It includes a unique history that is not often taught, about pre Civil War life for African Americans in the United States; purchasing freedom; and then what happened after freedom was bought. Here, the family moved to Africa and while there were benefits -- freedom, education for the children -- the fear of slavery remained (which was why the ships patrolled the coast), as well as dangers from disease and conflicts within Liberia. It's a fascinating look at life in 19th century Africa. But this is also about dreams: Martha had a dream that many knew about; Hicks includes a child's jump rope song: "Auntie Martha gonna see the Queen, stitching a quilt of coffee beans, how many stitches will it take? Two-four-six-eight!" Martha makes her quilt, saves her money; but also is introduced to the wife of the first president of Liberia. Martha's dream comes true. And this is also about family and tradition. Hicks has Martha saving her money in the same red tin box that the family uses when saving money to buy their freedom; Martha's quilting skills are learned from her mother. The illustrations: the endpapers reflect the design of the Coffee Tree quilt that Martha designed for Queen Victoria. Sample pages are at the illustrator's website. Included in the links below are links to photos of the real Martha Erskine Ricks; as well as photos of what may be the quilt Martha made. The author's website includes information about Martha Ann Ricks, and also information on African American quilting, fabrics and old quilt patterns. Links: a photo of Martha Ricks, at the time she met with Queen Victoria. October 2002 article from the Presbyterian Voice about Martha Ricks' visit to the Queen. More information on Martha Ricks, including a photo of the quilt. Detailed essay on Martha Ricks by Kyra Hicks. Liz B. began Tea Cozy in 2005. What is Tea Cozy? It's a discussion of books, movies, and TV shows; with an emphasis on books for teens. Archive for posts from 2005 to 2010, and 2014 to present are below. Archive for posts from 2010 to 2014 are at School Library Journal and at the Tea Cozy Archive. I am an Amazon Associate. If you click from this website to Amazon and buy something, I get a small percentage. Blog of the Day: Blog This! All Unquiet Things by Anna Jarzab. 2010. Charles and Emma by Deborah Heiligman. 2009. Countdown by Deborah Wiles. 2010. The Incorrigible Children of Ashton Place: The Mysterious Howling by Maryrose Wood. 2010. Neil Armstrong is My Uncle & Other Lies Muscle Man McGinty Told Me by Nan Marino. 2009. The Everafter by Amy Huntley. 2009. The Forest of Hands and Teeth by Carrie Ryan. 2009. The opinions expressed on this Web site are my own and do not necessarily represent those of my employer. All posts on this site are (c) 2005-2014 by Elizabeth Burns. All rights reserved. I reserve the right to delete comments made on this blog for any reason, particularly if they contain blatant commercial or offensive language.